Last month the Margaritaville University college ambassadors were challenged to submit their best burger recipe. A hungry panel of Margaritaville judges chose the best of the best to be featured on Margaritaville.com. Best thing about being part of Margaritaville University: Getting to spread island vibes all year round while being part of something I’m passionate about! Inspiration for my recipe: Just an island state of mind, really! 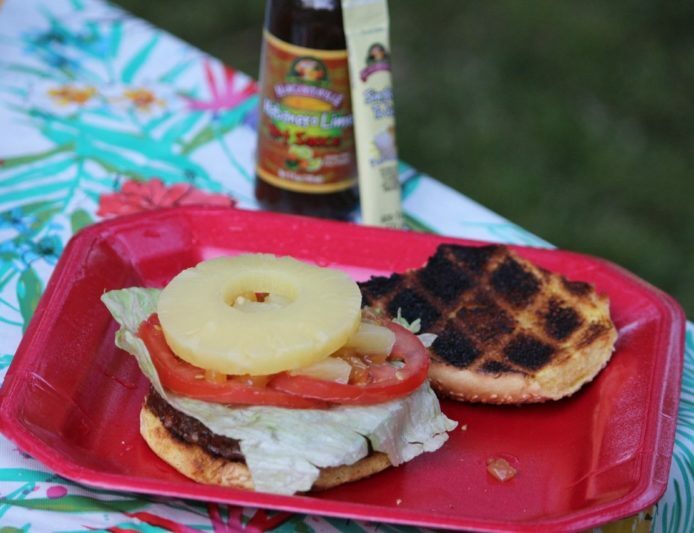 We focused on tropical flavors while being careful not to shade the delicious taste of a classic cheeseburger. Mix a few strips of shredded bacon in with ground sirloin. Form into patties. Sprinkle a pinch of applewood rub onto each patty. While these cook, form chutney topping. Mix pineapples, coconut rum, ginger, garlic, onions, and jalapeños in bowl. Sauté together. Build your burger! Place patty on bun, add cheese, lettuce, tomato, one pineapple ring, and top it with the chutney.